Video Title: Hapuka Estuary Wildlife Sanctuary – Tui, Kereru, Korimako, Whitebait. 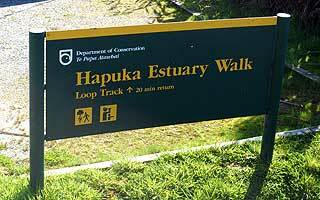 Description: The Hapuka Estuary Wildlife Sanctuary Walk is located approximately 17 km south-west of Haast. 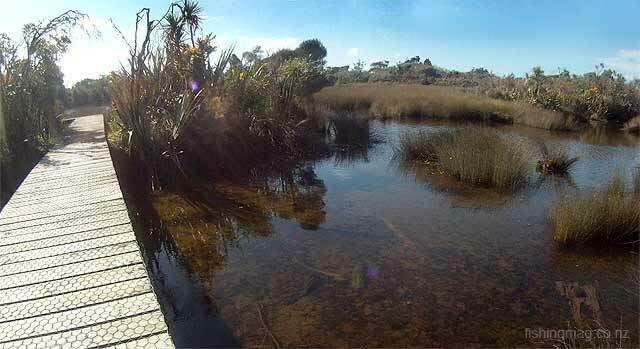 It is a conservation area where you can see whitebait and native birds very close up in their natural state. 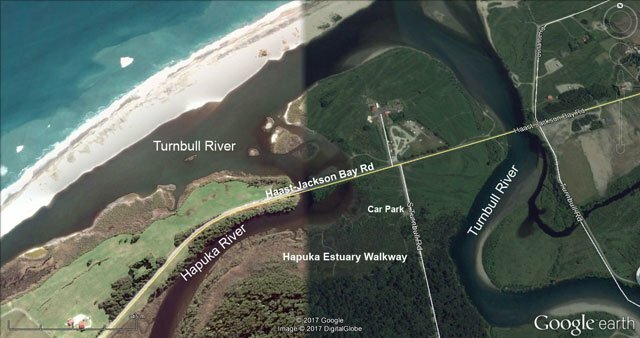 The Hapuka Estuary Walk is located approximately 17 km south-west of Haast on the main highway. The loop track is a 1 km in length and takes about 20 minutes to walk around it. Though you can spend a lot more time spotting fish and whitebait in the tidal estuary, and native birds in the trees. The Hapuka Estuary Wildlife Sanctuary is administered by the Department of Conservation and is very well setup and signposted with information boards. This wetland area is closed to all fishing and whitebaiting and is complete with boardwalks over the estuary and creeks. Hapuka Estuary Walkway. The entrance and car park are off South Turnbull Road. There is also a viewing platform looking out towards the Open Bay Islands of Taumaka and Popotai. You can see and hear the surf in the distance. Even if you’re not really into nature walks you’ll be glad you took the time to see this one! Department of Conservation West Coast Wetlands. The best time of year to visit is in the spring. At this time of year the clear, though tannin stained, waters beside the boardwalks and viewing platforms will be teeming with whitebait. You can easily see close up and are sure to be amazed by their enormous numbers. Also in spring, the yellow kowhai is in flower and you can see and hear the tui, Korimako (Bellbird) and kereru (native pigeon). Although the birds are wild they are in their native habitat right in the trees next to the track. You can see them very close up. It is a magical experience. Closing your eyes and listening you can hear the most beautiful bird-song that must sound the same as it once did hundreds of years ago! 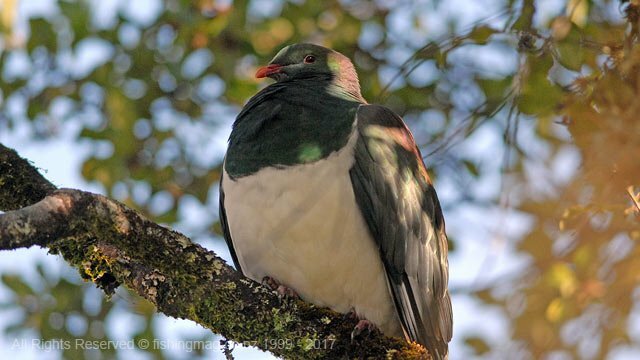 This kereru (native pigeon) was only about 3m away when I took this picture. You are standing on the edge of an estuary one of the most fertile and biologically productive places on earth. Twice a day, tides carry fresh nutrients in from the ocean to mix with sediments and nutrients brought down by the river. In this dynamic transition area plant and animal life abounds. As plants die, the detritus is colonised by bacteria, protozoa and other micro-organisms such as bivalves, crabs, snails, worms and fish. Among the sediment feeders the mudflat snail (titiko), easily visible on the mud at low tide, leaves conspicuous trials of excreted mud. One of the larger inhabitants, the yellow-eyed mullet, will filter 1.5 kilogrammes of estuarine sediments a day to feed itself. More South Island Wetlands you can visit DoC brochure. The tannin stained tea coloured water is really a nutritious mudflat soup. Testifying to the high productivity of estuaries are flocks of birds, especially oystercatchers, stilts, and gulls. On the edge of South Westland estuaries, rushes and sedges providing habitat for various native birds, among them the Australian Bittern, fernbird and pukeko. The Kowhai, flax and fuchsia growing around the edge of this estuary attract flocks of native pigeon, tui and bellbird. Moreporks are heard at night. 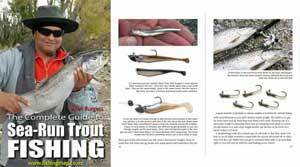 Estuaries are also important breeding and nursery areas for many fish. Eel, Kahawai, flounder and mullet are present here along with whitebait. Department of Conservation walks and activities in the Haast area brochure. 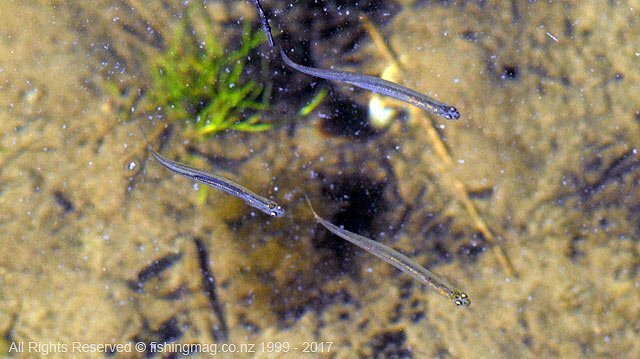 Whitebait in the Hapuka Estuary Wildlife Sanctuary. Misunderstood and misused for too long, estuaries are now appreciated as biological banks which contributed enormously to the welfare of Fisheries and well-being of many birds. Where once you might have seen a useless swamp, such areas are actually vital to the future of our much valued and prized whitebait fishery. Riparian vegetation like reed beds provide shade and food for small fish and many other animals and can also filter particles and chemicals that run down into the water after rain. Inanga migrate downstream to estuaries in the autumn and lay their eggs among the water edge vegetation. The eggs are better protected from drying out when there is plenty of vegetation over the water. The eggs hatch several weeks later when covered by spring tides (for inanga) or floods (for koaro and kokopu). The larvae float out to sea where they live and grow over winter, before migrating back upstream as whitebait in spring. Hapuka Estuary Walkway. Map courtesy of Google Earth.